Bow Wow and his girlfriend, Leslie Holden, were involved in a heated dispute which resulted in physical violence. Bow Wow's mugshot emerged online which showcased the rapper with serious scratches across his face. TMZ's now acquired more photos of Bow Wow before he and Holden were arrested and the rapper left pretty marked up. Photos of Bow Wow after Leslie Holden allegedly scratched him up have surfaced online. 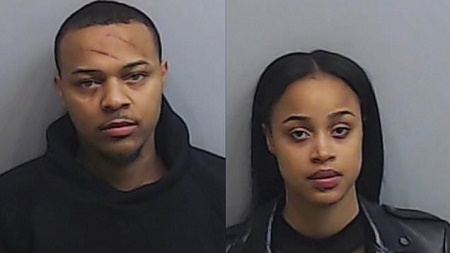 Bow Wow's mugshot already indicated that his face got marked up badly but the new photos reveal that he sustained injuries to his chest, neck and even a deep bite mark. Bow Wow was arrested on Saturday morning for assault. A 911 call from Holden revealed that he allegedly hit her. She was also arrested for hitting him as well. Leslie alleged Bow Wow struck her several times before taking her phone and locking her inside of the bedroom of their apartment. Bow Wow and Leslie Holden were later hit with charges of misdemeanor battery.